500,000+ Truckers Can't Be Wrong! File Your 2017-18 Form 2290 Now! 500,000+ American truckers can’t be wrong! How can your trucking business benefit from filing IRS HVUT 2290 with ExpressTruckTax? Filing your IRS HVUT 2290 can be stressful and confusing, especially if you’re not using an online e-file solution. ExpressTruckTax provides a step-by-step e-filing guide and US-based bilingual customer support. With over 10 years of experience as an IRS-authorized HVUT e-file provider, we take every precaution to keep your data safe. Trucking businesses throughout the US trust ExpressTruckTax. Create your free account today and enter your tax information, including your VIN & EIN to get started filing your Form 2290 today. $9.90?! That's it? Fantastic. This is the first time in 18 years I haven't had to go to the IRS office. I love you guys! Thank you so much for your help. You made it real easy. Last time I used some other provider and it took over a week to file my return. With you it took less than an hour to file a fleet of 100 trucks. Where were you all this time? I am glad I found you. I appreciate your time. It's great to have this kind of support! This is GREAT software. Great. It's so self-explanatory. I'm very impressed. It's like the TurboTax* of 2290s. This is the first time I'm doing this and it's super easy. I called the other guys and nobody answered the phone. You guys picked up right away. So far I'm very happy and I will be recommending you to my friends. Thank you so much! Thank you so much for your help. I overpaid with ***2290 and they wanted to charge me to fix my VIN number. Not only did you guys let me E-File my VIN correction, but you let me do it for FREE. I can't thank you enough! ...Wow, I wasn't expecting anyone to actually answer the phone. I called three other guys and nobody answered. You picked up after the first ring. I wish your company could do ALL my taxes! ExpressTruckTax Has 2290 E-filing Features Every Trucking Business Needs. Get ahead of the crowd! E-filing for the IRS Form 2290 is now available for the 2018-19 tax year! Quickly e-file IRS Form 2290 with ExpressTruckTax and receive your stamped Schedule 1 within minutes. Get automatic updates via email, text, fax, mail, and even notify your company/carrier. E-file VIN Corrections for FREE! Easily correct any Form 2290 VIN error online, for free! Contact our dedicated support team for help. ExpressTruckTax is the only service that offers free VIN Corrections. Truck Zone allows you to store thousands of vehicles in one place–it’s your virtual garage! Add new vehicles as your fleet grows, and keep their information stored automatically year after year. The next time you E-file your Heavy Vehicle Use Tax, all of your trucks will be saved, ready to be added to your new return. Take advantage of discounted pricing on unlimited filings throughout the tax year. Bulk upload thousands of vehicles at once. Unlimited e-filing includes both 2290s and 8849s. Whether you're E-filing for 10 or 10,000 clients, we provide support every step of the way. 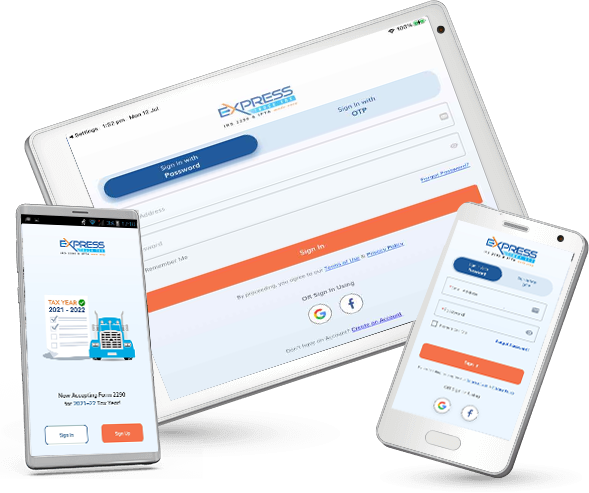 ExpressTruckTax allows you to manage all of your clients and add multiple EINs under a single account. Specialty pricing options include prepay, postpay, or pay as you go. One of our newest and most convenient features allows tax professionals to have their customers E-sign returns. No more faxing forms to clients and waiting for them to be signed and returned. Now clients can open a link sent straight from their tax preparer and E-sign it in seconds on any computer or mobile device. Available HVUT app for any Android or iOS mobile device. It's free and as mobile as you are. Add vehicles directly from your Android or iOS mobile device. E-file your 2290 anywhere, even from the cab of your truck. Before we send your return off to the IRS, we'll even perform an Instant Audit check for you to catch any major errors that could cause your return to be rejected. This feature can save you from the time-consuming frustrating process of dealing with the IRS. All the information in our system is saved in cloud-based storage. Everything you need is conveniently stored in your account. This allows you to access your information from anywhere, instead of just the device you used to upload your information. How do you easily e-file IRS Form 2290? Click play to see how. We have started accepting returns for the 2018-2019 tax year! iPad, or Android Devices, with the free ExpressTruckTax app.